Cockroaches are one pest that has totally adapted to living with people. They live where we live, they eat what we eat. They run rapidly, hide well, eat anything, and have an amazing reproductive capability. Cockroaches are very successful pests, which is why you need the services of a successful cockroach control company! The German cockroach is the number one cockroach pest of homes, apartments, and restaurants. It hides during the day and scavenges on a wide range of foods at night. German cockroaches generally live within 12 feet of food and water. They are mostly found in kitchens but may also be found in bathrooms and wherever people eat and drink. If you are seeing lots of cockroaches during the day and in rooms beyond the kitchen, you have a serious infestation. There are other reasons why cockroaches are so successful and so difficult to control. Cockroaches like warm, humid conditions and their growth and development speeds up as the temperature rises. At 73 degrees, a German cockroach egg case hatches in 34 days. At 83 degrees, it takes only 17 days! During the day, cockroaches remain hidden deep in narrow cracks and crevices making it more difficult to reach them with insecticides. The German cockroach female further protects her egg case from insecticides by carrying it protruding from her abdomen until just before it is time to hatch. She then deposits the egg case in a safe place. It’s not unusual for 36 new cockroach nymphs to hatch out from a single egg case weeks after treatment. Cockroach control is especially difficult in apartments because they can so easily move from one unit to another by following pipe chases or electrical lines. Most every apartment building has one or two heavily infested units that seem to feed cockroaches into adjacent units. 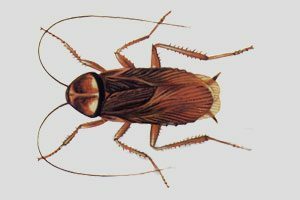 Successful cockroach control in apartments requires a coordinated and determined effort between residents, property management, and the pest control contractor. Cockroaches are more than just an annoyance in our lives. They can carry disease organisms on their bodies. They transfer germs when they wander over garbage and human waste and then contaminate clean surfaces or food in your home. The shed skins and feces of cockroaches cause allergies or asthma in sensitive individuals. Studies have shown that cockroaches are the primary cause of childhood asthma in inner cities. Two other cockroaches, the American cockroach and the oriental cockroach, can sometimes be found in the lower levels of buildings such as basements or crawlspaces, or outside around foundations. Sometimes an exterior foundation treatment is necessary to keep these roaches from moving inside. Indoor treatment has come a long way from the olden days when cockroach control meant monthly fogging or spraying of baseboards. In the 1980’s, pest control professionals began using cockroach baits. These highly successful baits have eliminated routine spraying for cockroaches, with all of its smell and vapors. Today, professionals apply gel or container baits in cracks and crevices where cockroaches live. If sprays or dusts are used, they are low odor, low toxicity and are specifically targeted to certain sites; not sprayed over a large area. At Colonial, we go one step further in cockroach control. We also apply an insect growth regulator. Insect growth regulators are low risk insecticides that work differently than standard insecticides for effective roach extermination. They do not kill cockroaches directly but instead interfere with their life cycle by blocking the nymph’s ability to turn into an adult, or by blocking the ability of the adult cockroach to reproduce. Insect growth regulators will continue to affect any surviving cockroaches for several months. Our experts will tailor a cockroach control program for your specific needs. First, our trained technicians will do a careful inspection to determine the level of cockroach infestation and the sites requiring special attention. Most cockroach infestations can be treated successfully with the application of cockroach baits and an insect growth regulator. If your cockroach problem is more severe, that’s not a problem for us. We can start with an initial intensive service that involves application of insecticide into cracks and crevices and deep into wall voids. Whatever type of service you require, we’ll stay with you until we have your cockroach problem resolved. Read more about cockroach control on our blog. Cockroaches Do Get into Ear Canals! Please call today for a FREE ESTIMATE for cockroach control at 1-800-525-8084 or make the request online at REQUEST A QUOTE. I have been with Colonial Pest Control for more than 12 years and have always found them to be very responsive, prompt, polite, professional and helpful in addition to being very fair with their pricing. They have gone above and beyond many times. I have never had a complaint and have referred several friends and family members.